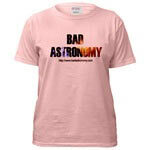 What's New at Bad Astronomy in 2006? Yahoo!News is reporting that a comet fragment will hit the Earth in May, causing "devastating effects". Can this be true? Quick! What's the name of this website? I was on "Coast to Coast AM" talking about various bad astronomical things... and you can read all about it here.